Promotional Products have been around for virtually 200 years. However, it wasn't until the latter part of the 19th century that a large quantity of promotional products were marketed, therefore leading the industry as it is known today. In 1914, the first trade shows became a part of the promotional product industry. Now, trade shows play a vital role in promoting your business and promotional items and liaising with, and meeting new clients and are held several times each year. Although the promotions market has changed and expanded greatly over the years, the original concept behind the message remains the same; get your message or brand seen. Most advertising is here one moment, gone the next. Promotional products are the medium that remains to be seen. Promotional items are increasingly becoming a regular part of companies' budgets with the promotional products industry being one of the fasting growing industries in the nation with total sales exceeding $2.02 Billion (an increase of 45% in the last 5 years). People are realising that potential business growth can be directly related to the use of promotional products and creative advertising. So you ask; why are promotional products such an important part of a campaign? Well firstly, they are affordable and don't have to be supported by more advertising. Promotional items constantly reinvent themselves and there are more than 250,000 promotional products currently available in today's marketplace. Promotional items help to drive traffic to a website or similar location with more information and promotional merchandise are also durable and they aren't easily discarded like print advertising, business promotions appeal to customers as a way to get something for nothing, eventually generating business back to the company and records show that 40 percent of people can remember the names of the advertiser as long as six months after receiving a promotional item and 31 percent still use the promotional item one year later. 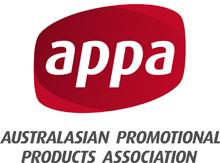 As a member of APPA- Australasian Promotional Products Association, Vivid Promotions prides itself on providing high quality Promotional Products at affordable prices. Vivid Promotions works on a B2B or Business to Business basis, buying from wholesale suppliers who only sell directly to a reseller- such as Vivid Promotions, as the middle man Vivid Promotions offers promotional products custom made to order. Printing your promotional merchandise with your company logo is one of the easiest and most simple ways to get your brand noticed. When branding your promotional products make sure you think about what will make your logo stand out the most against other companies promotional products and what colours and themes work well together. For example you wouldn't have a red lip balm tube with a white label over the top as it defeats the purpose of having a bright coloured tube. Picking the right promotional item for your business can be a hard task, but rest assure with Vivid Promotions' knowledgeable and enthusiastic staff, choosing the ultimate promotional product will be a breeze. Sure, there are still regular promotional items such as Promotional coffee mugs, branded business cards, printed pens, engraved keychains and other printable promotional products. Throughout the year, each season has its own factors that impact the promotional products industry, including weather, holidays and most importantly, events. These days there's just so much more on the market; High quality uniforms, Gardening tools, promotional bags and totes, office supplies, personal music players and speakers, pedometers, promotional drink bottles, flasks, picnic cooler bags, pet products, temporary tattoos, a whole range of beauty and skincare promotional products, the list of custom imprinted promotional products is practically endless. If there is room to brand it, Vivid Promotions has it! These items not only encourage potential customers, they reward existing customers and are often given to employees as rewards or gifts. It has become necessary for companies to present incentives to their employees to keep them motivated and to improve their efficiency. Promotional merchandise are also being used progressively more these days, as gifts for staff members. These are items which are used for daily office use and often cheer up the everyday work environment. Promotional products serve the purpose for any occasion, be it a member's birthday or someone who has done a great job, or as a stress buster to take the load off. High quality promotional products are always in demand and serve as wonderful gifts for your employees generating a feeling of belongingness towards your company. All you need to do is tell Vivid Promotions your specifications and our team of experts will do the rest for you! With the gifts in their hand the customers will always think of your company first and they will be thankful for the gifts you have given to them previously. Promotional products allow you to be more integrated with the personal lives of your customers, clients and employees by giving them products that bear your company's name or logo as these promotional products make it in to the home or the office of the recipient. Promotional products bring great success to a business in numerous ways. They are useful in giving the much needed boost to your business. Promotional gifts are one of the most effective marketing tools available these days. They easily outshine many of the conventional methods of advertisements. Promo products are in a way the finest process to impart huge success to businesses. They offer better returns on the investments made and are therefore mostly preferred over other forms of brand promotion. The use of promotional items can never come to an end considering how essential they are becoming to the business plans and marketing strategies of today's corporate world.